By quite a bit of persistence and a huge stroke of luck, this past Friday I entered the original Altamira cave for a very brief 37 minutes. It was magical, completing a full circle from a visit as a child, of which I have faint recollections and certainly did not appreciate at the time. For me personally, one of the most important and amazing experiences in my life from a personal interest and professional standpoint. This is what I do! A fit culmination of sorts. Although a personal “circle” is completed, it continues to fill and expand with more knowledge and appreciation for the Paleolithic art of Northern Spain. Each and every time I enter a cave or reproduction I learn or observe something new. Entering the original Altamira was no different in that sense. How did I get in to the original Altamira????? The cave has recently been opened for a highly controlled and very limited experimental trial where five persons per week will enter the cave. The five people are chosen in a lottery draw from those that happen to be at the Altamira cave museum on the day and at the time that has been selected for entry. The day is chosen at random once a week and the only way to have a chance is to be at the museum at the time of the drawing, no preregistration or list to sign up on ahead of time. As they say in the fine print “you must be present to win.” I was there everyday last week and on Friday was informed that the draw would be that day. That is the persistence part and one of the advantages of living very close to the cave. Now the luck. I put my name on a form given to me at the museum, folded it in four as instructed and inserted it into a clear plexiglass box along with everyone else that was present and chose to participate in the draw. This day we were about 40 people, so my chances were about one in eight or 12.5%. Not great, but in the scheme of lotteries, pretty good considering the first week there had been 100 in the lottery for the five slots. When the drawing occurred I was the the fifth name drawn and ecstatic to say the least. A sixth name was actually drawn when one of the lottery winners inexplicably gave up her slot to the amazement of everyone. I heard her say in Spanish to the Altamira personnel almost defiantly, “I´m not going in unless my husband gets to go in also.” The Altamira personnel informed her that was not possible and after asking her again, “Are you sure you don’t want to go in?”, she gave up her slot. Part of me is glad this person didn’t go in as she obviously did not value this possibly once in a lifetime opportunity. I will never understand what she did but I have to chalk it up to blind love or to….. I´ll bite my tongue now…. Those that are lucky enough to enter form an important part of the ongoing experiment, consenting to the predetermined restrictions and rules to enter the cave and also agreeing to participate in the study by giving detailed feedback about their participation. You commit to a few hours of time before, during and after the visit to the original cave. 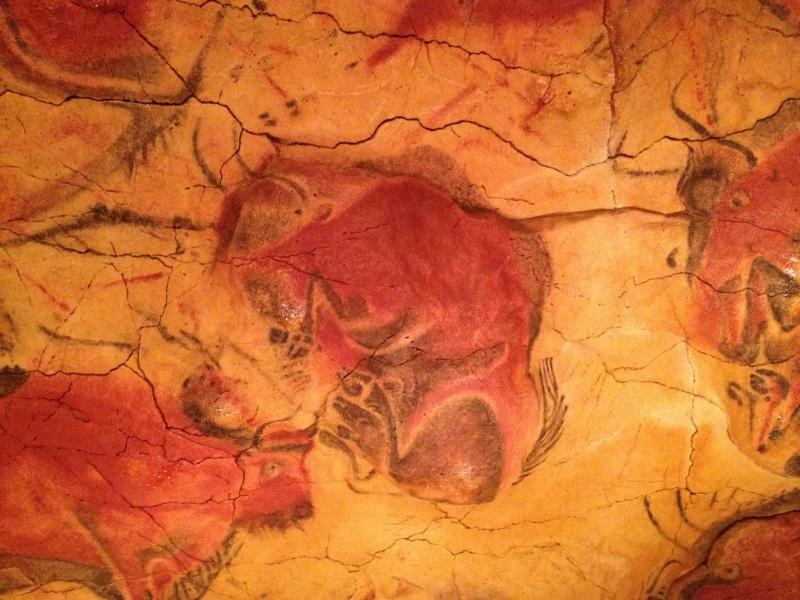 After a few formalities, the first thing we did was visit the exact reproduction of the cave at the Altamira museum. I have spent hours combing over the reproduction since it opened in 2001 and know it intimately, inch by inch. For those that don´t, it was a great way to see paintings more clearly, with lots of light and with unlimited time, something you don´t get to do in the original cave. Frankly, the reproduction is a much better way to see the art than the original. You actually get to see things that are in areas you are not allowed to access in the original becasue of the restricted dimensions of some areas. It is not the same experience of course, but if your real interest is the art and its significance, you are much better served by the reproduction and the advantages it offers. After viewing the reproduction, it was showtime. We walked about 200 meters to the previous museum building where we were explained the rules of the visit and given protective clothing and shoes to enter the cave. We put on a jumpsuit with hood, sock booties, plastic clogs and a face mask. The protective gear we donned serves the purpose of retaining body heat for one, but also preventing the introduction of foreign materials or bacterias as best possible so as to alter the environment inside the cave as little as possible. We left all of our phones and cameras behind as they are not permitted in the cave. We were each given an LED headlamp and each of the two guides also carried a larger light with them. Once in our “bunny suits” and equipped, we headed to the cave entrance. Prior to entering we hosed off our clogs to remove any dirt or grass from the walk over, then remaining on a metal grating in order to not pick up any new debris prior to entering the cave. The local media was there and filming us (they actually interviewed me and I had all kinds of calls from family and friends to let me know afterwards). Here is a painless link if you want to see it (it says 30 minutes but this is all in the first minute) . It shows us in our bunny suits and preparing to go in. Prior to entering, we rinsed our feet one last time in a metal pan with water at the doorway. We then entered the cave. I was already emotional and full of adrenaline knowing that I was going in (you may have noticed in the video). Now on the other side of the metal door at Altamira, I observed the walls and ceiling. I felt the floor I was walking on. A sense of wonder came over me. I was coming home to a place I truly belonged. A strange but magnificent feeling of fulfillment consumed my body. 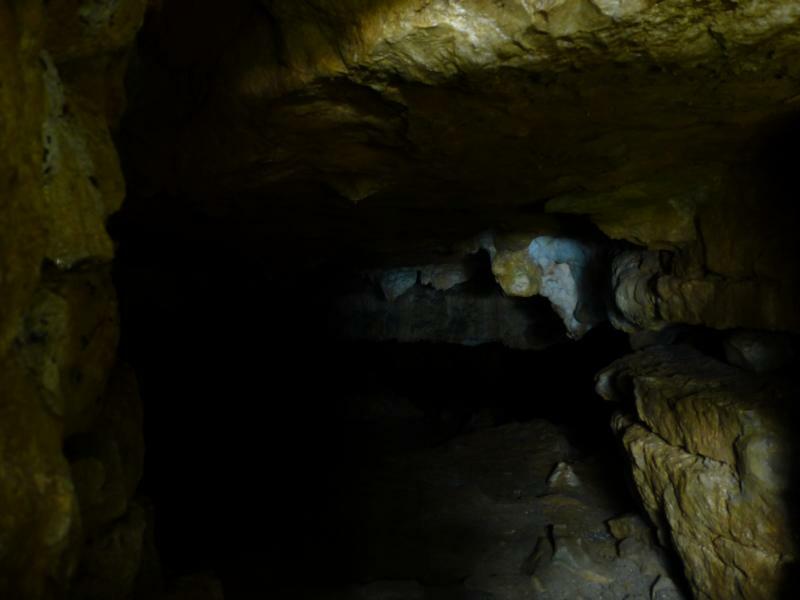 I felt an immediate connection to the cave and its former Paleolithic inhabitants. I have spent years in and around the caves of Northern Spain with Paleolithic art and it was as if all of those experiences came rushing into my being at the same time. Hard to explain but magnificent. Going into one of the caves always puts a huge smile on my face and fills me with wonder, how could this not happen going into Altamira? 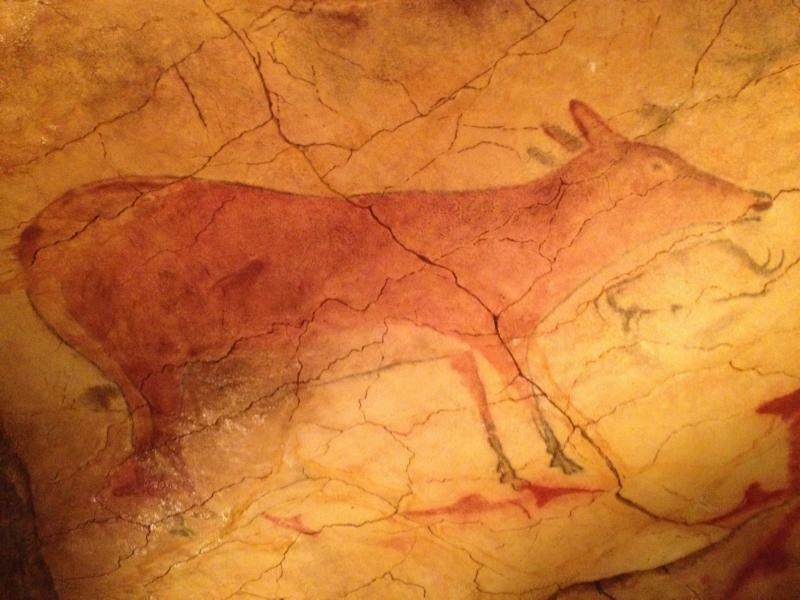 Once I came to grips with the fact I was in the real Altamira, I started to notice all the details of the cave. The cracks in the ceiling, the small stalactites and very few other formations, the flat and very angular lines of a cave formed by a series of cave ins rather than by a river flow as is the case of many of our other caves. I also noticed all of the sensors everywhere. The sensors, like us, were part of the experiment and measured our movements and all of the real time changes as we were in each area of the cave (temperature, humidity, CO 2 levels, etc.). We then began our visit of the cave, following is a map to help orient you as I describe it. The map shows the entrance we used (Entrada actual) and then with blue lines divides the 270 meters or so of cave into sectors (I to X). The black lines are the edges of the cave. Yellow lines show natural contours in the cave. The purple lines are steps or modifications added (not natural). 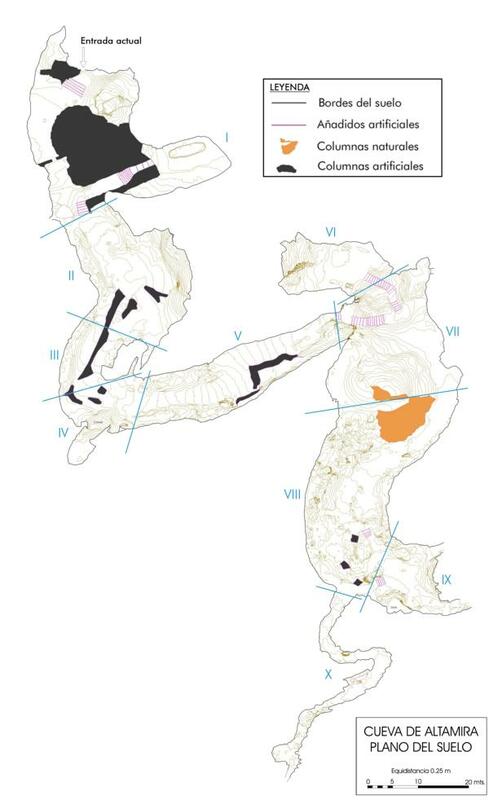 The yellow areas are natural columns inside the cave. The black areas are artificial columns added to prevent further cave ins in the interior of the cave. The first area we explored was the entrance and the original excavation area of the cave (Sector I). This excavation area was on your left as you entered the cave. 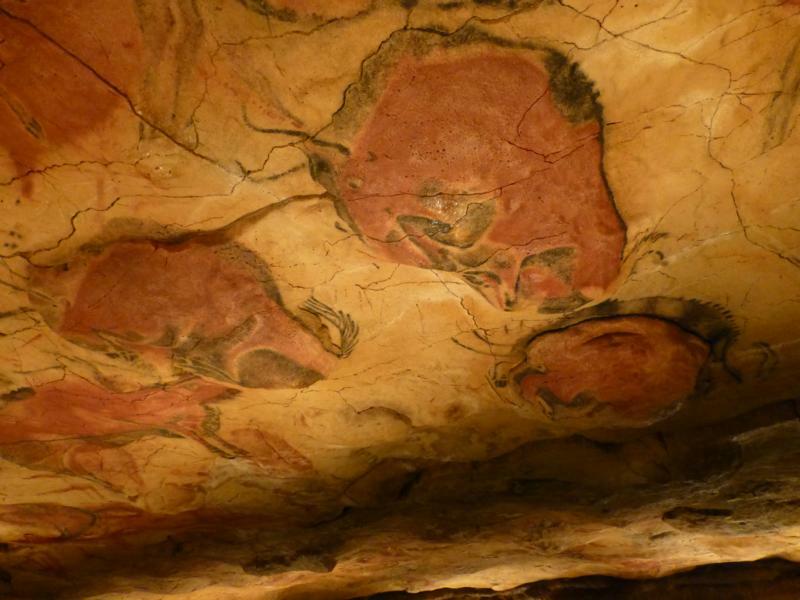 The cave had been excavated as early as 1879 by Marcelino Sanz de Sautuola, who rediscovered Altamira´s paintings in 1878. 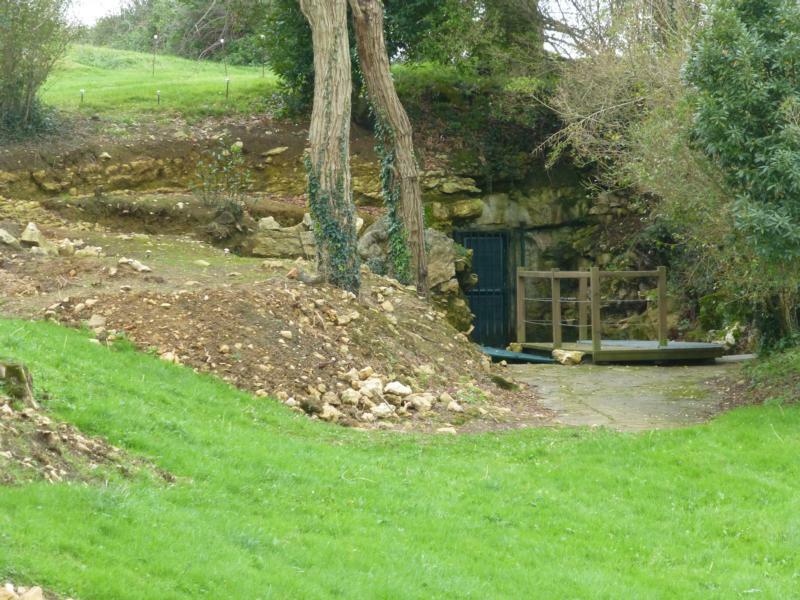 The cave has undergone a series of significant excavations since then, with the most recent ones in 2010. 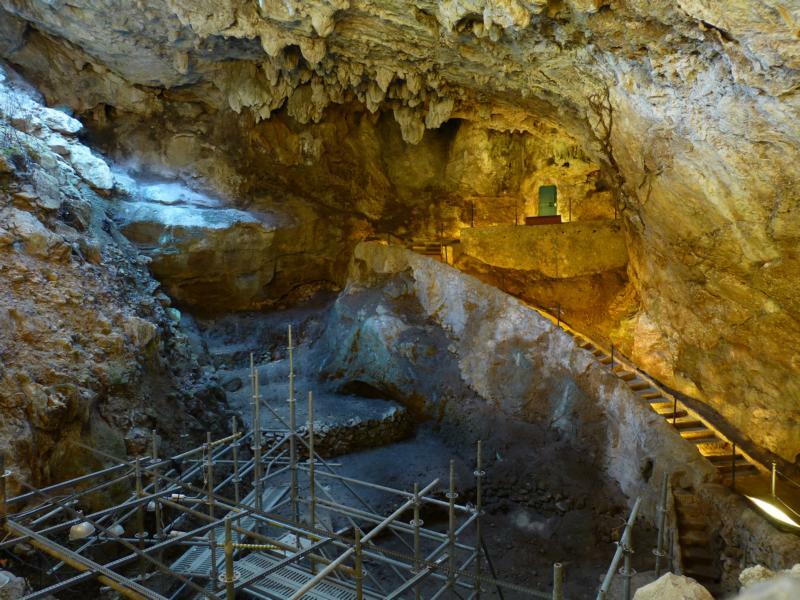 Much of what we know about Paleolithic humans came, at least initially, from this excavation site. Since then, there have been excavations at many other sites, in Northern Spain and Southern France in particular, that have populated our knowledge bank about Paleolithic humans and the art they created. From here we moved deeper into the interior of the cave. We passed the hall of the polychromes to our left just before leaving Sector I. This hall houses Altamira’s most famous art, but we would save that for last. We progressed into Sector II, then III and IV. It was interesting noticing all of the artificial columns which were very well made to look just like the original walls, but whose large blockish forms were conspicuous enough to give them away. From there we continued down and into the bowels of the cave. We passed through Sector V and into Sector VII, the largest part of the cave and giving you the sensation of being in a geologic cave, unlike other parts where it can seem more like a tunnel of sorts. We shined our lights off toward Sector VII. We could see a small passage that led to the deepest part of the cave where we would not be going. 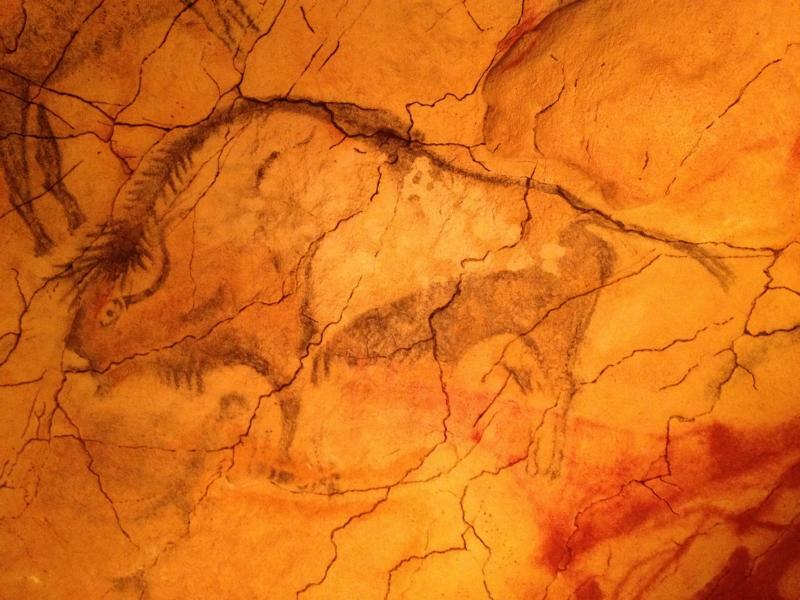 It also contains art and is reproduced in the Altamira museum cave reproduction. I believe the area reproduced in the museum corresponds to Sector X on the map. We continued down and into a smaller hall of the cave in Sector VI. We saw an incomplete horse drawn again in black. Above it and on a rock panel closer to us we were shown a magnificent engraving of an aurochs (an extinct species of ancient bull that was the predecessor of all modern domesticated cattle). 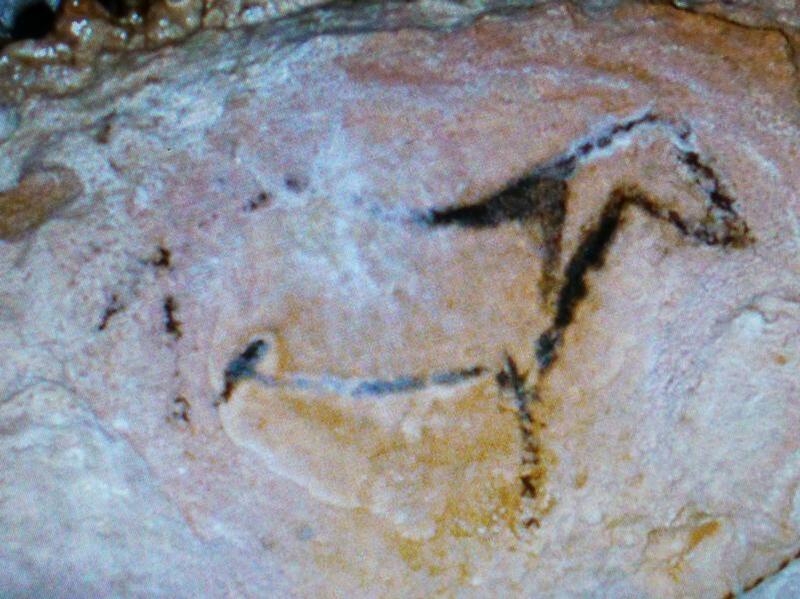 Here is a picture of a horse from another cave so you can get the idea, unfortunately I can´t provide anything similar to the near perfect engraving of the aurochs. From here we retraced our steps back up toward the entrance. On our way back we stopped in Sector IV to view a beautifully done painting of a horse. It was done on top of a large cascade formation (the area labeled “Colada” on the map), which is quite rare. Paleolithic artists were very carefulin choosing where they painted and tended to avoid areas where cave moisture or filtrations could erase their work. The guide called it incomplete pointing out the back, rump, hind quarters and belly. As soon as she did, the rest of the figure “popped,” as my client Trallee once described this referring to when you clearly see a figure, so blatantly obvious, once you have identified it for the first time. Any doubt about whether it is there or not is gone once you have see it once. I pointed it out but was dismissed as it wasn’t documented as a complete figure. It was quite complete to me and this is not the first case of I or one of my clients seeing something that is clearly there, but has not been reported on before. One of the joys of going into these caves. Anyone is just as right as any “expert”, becasue none of the original artists are around to tell you what the intention was or what is “really” there. Believe it or not, this was possibly the most special, single experience in the original cave of Altamira for me. 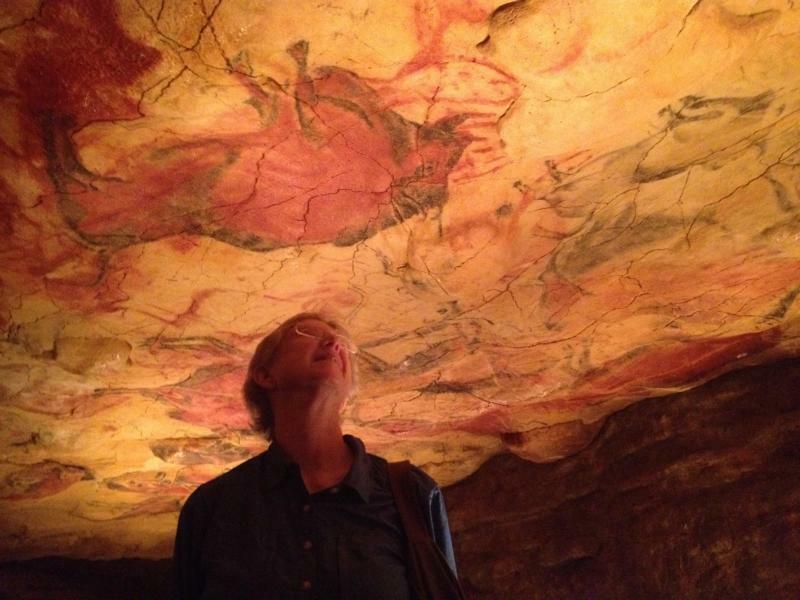 My personal connection to the caves and the art they contain, that in many cases others don´t or can´t perceive, really struck a cord with me at this very moment. Paraphrasing the words of another client, Chris from Australia, I really felt like part of the herd of that horse that was on the cascade in front of me. A magical feeling that transcended thousands of years of the past, a past I am clearly deeply connected to. We then made our way back out through Sectors III & II. As we got to Sector I, we took a right into the Sistine Chapel of Paleolithic art. My heart began to race. I´d be lying if I said I wasn’t overcome with excitement and emotion as I entered this indescribably powerful place. The energy of the past and the culmination of Paleolithic art that is this one hall, of one cave, swooped over my body. It was a re-genesis (yes, I just coined that) of 37 or so years between my first visit to Altamira and all of the other caves I have explored and wondered at so many times since then . It was a place I knew I belonged and that I was destined to come back to not realizing it until that very moment. It was a deep rooted feeling that I took with me and that will remain with me for the rest of my life. Very powerful stuff. This hall is often referred to as the Sistine Chapel of Paleolithic Art. It should be the other way around, the Sistine Chapel is the Altamira of Renaissance art. Credit where credit is due. Notice how the entire figure is painted on a rounded rock outcropping on the ceiling giving it three dimensional volume (redundant I know) and using the relief to accentuate the anatomical features of the animal (bulge for hind quarter, hump on the back and the head of the animal). Simply brilliant. It’s hard to perceive in the picture but the belly of the deer is painted directly on top of a large, rounded bulge in the ceiling. The thought is that this depicts a pregnant female deer with a large belly and the new life inside of her. I´ll let you draw your own conclusions as to why or the significance of this beyond the obvious. Remember, they are just as right as anyone´s. This my personal favorite from the cave of Altamira. It depicts a bison laying down whose head is turned back and looking back at its hind quarters or behind itself. It is amazing to me that the artist had the vision to choose this spot to paint, where he or she could give volume to the head looking back but also to the bulging hind quarter that forms when a bison (or cow for that matter) lays down. Its easy to see now, but try to imagine it as bare rock. Would you have thought this? Magnificent and a deep understanding and knowledge of the animals they painted, from memory nonetheless. We had a very limited time in the cave to begin with, which was now down to a few minutes. Unlike in the cave reproduction, you only have limited access to the hall, as only a portion of the original floor had been excavated and in other areas you would have been too close to the art. I quickly scanned the ceiling noticing all of the figures that I know so well. There are over 100 in this one hall and it was a bit of a whirlwind with my mind trying to recall all of them at once. Once again, I realized at that moment why the cave reproduction is so important and serves such a grand purpose. It will never be the real cave, but you will never be able to see things in the real cave like you can in the reproduction: so clearly, with great lighting, with as much time as you want and at a comfortable distance for you to view it. As they gave us the five minute warning I rushed to one figure in particular that has always called my attention, an anthropomorphic figure. Anthropomorphic figures are part human par animal. It is an engraving and it was hard to see in the dim area of the real cave. The guide told me not to waste my time as there was so much else to try to see, but I was nonetheless delighted to be able to find it. Then in a flash, it was over. The other guide told us it was time and that we had to leave the cave. She herself had remained outside the hall of the polychromes to not alter the environment more than necessary. I bowed my head in humility and gave a little personal thank you to the artists that created this masterpiece. This is truly one of the wonders of the world. Back at the museum we filled out a lengthy questionnaire (10 pages or so) about our experience and our opinions over how it all went. Everyone thanked us for participating in the study. One of the other lucky persons that entered the cave with us was English. As the entire visit is in Spanish, I translated and explained everything for him. He was infinitely grateful and bought me lunch. Afterwards I took he and his wife, who had not entered the original, back into the cave reproduction and showed them some of the things he wasn’t able to see in the real Altamira because of the time and the restrictions on which parts you could actually access. The cave reproduction is so well done and I appreciated its value even more after having just been in the real cave. 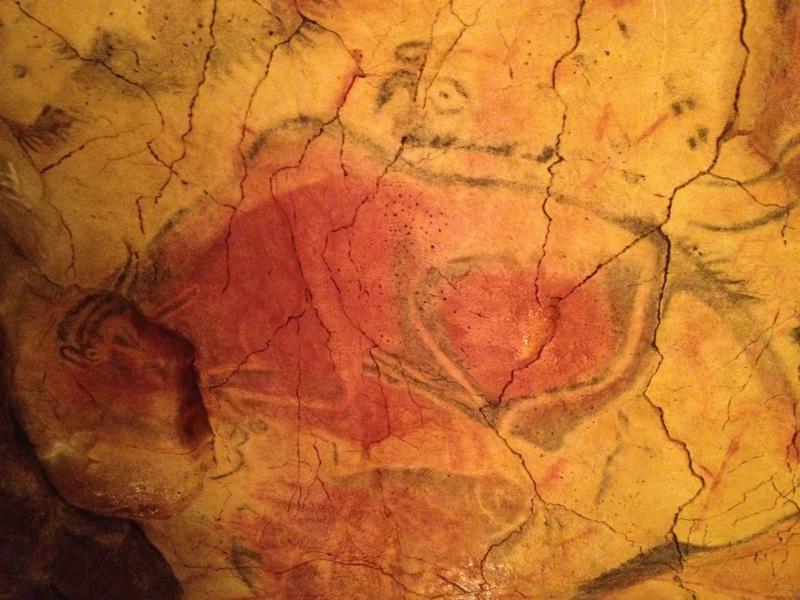 It affords things the real cave simply can´t and won’t ever offer, if we hope fr it to survive for another 30,000 or more years (the oldest paintings in Altamira are that old). I have my first tour of the year scheduled next week. A client whose primary interest is the caves and found me via my cave website. I can now better explain the interior of the cave and it’s physical layout, but that is no substitute for the cave reproduction where we can unhurriedly explore as much of the art of Altamira as we want, without struggling to see becasue of poor lighting and being too close to the ceiling. 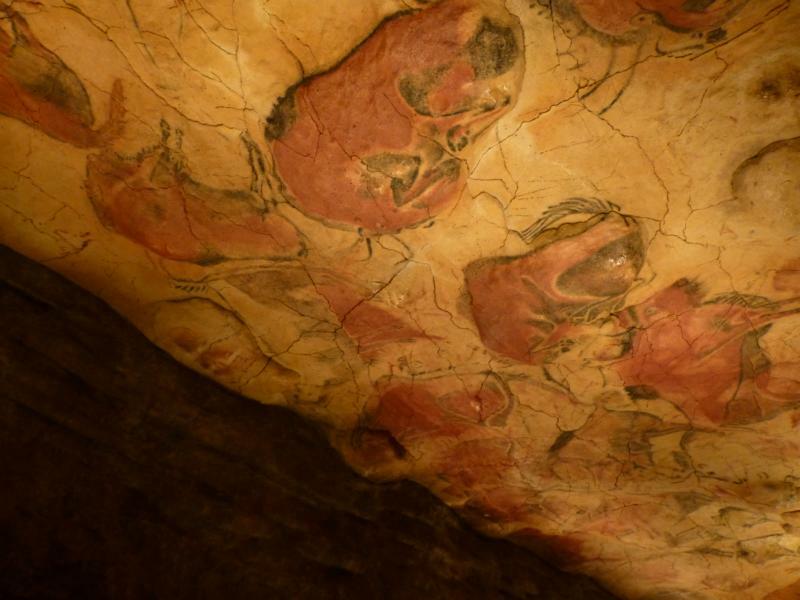 We will visit Altamira and several other caves with art to get a more complete picture of the Paleolithic and Europe´s oldest art. We´ll also head in search of the wallcreeper (a bird found in Northern Spain) and tackle a few other specific interests he has. 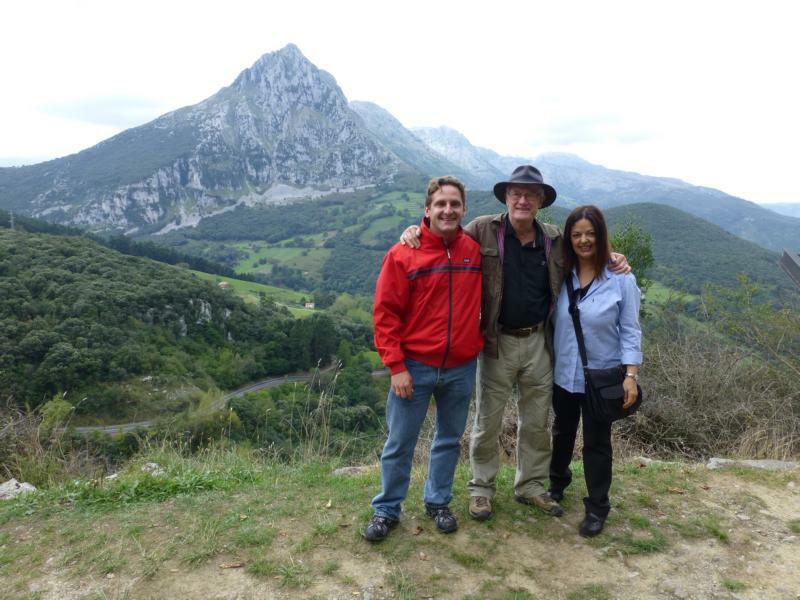 As with many of my clients, they initially contact me for the caves, but once we get to talking about their other interests they realize all the other things available in Northern Spain. If you are going to come this far, you may as well do as many of the things you love as you can! Thank you Altamira. I am infinitely grateful to you. I am anxious to share my experience with others.